SNITZEL (AUS) (Bay 2002-Stud 2006). 7 wins-4 at 2, MRC Oakleigh P., Gr.1. Champion Aust. Sire in 2016-17. Sire of 811 rnrs, 581 wnrs, 79 SW, inc. Shamus Award (MVRC WS Cox P., Gr.1), Redzel, Hot Snitzel, Sweet Idea, Sizzling, Snitzerland, Russian Revolution, Trapeze Artist, Summer Passage, Wandjina, Invader, Heavenly Blue, Spill the Beans, Menari, Snitty Kitty, Thronum, Time for War, Flying Snitzel, Showtime, Tangled, Farson, Perignon, etc. Martinelli (g. by Snitzel). 5 wins. See below. Swiss Coin - Sun Coin (Sing.) (g. by Not a Single Doubt). Placed at 3 in 2016-17 in Aust. Helvetia. 4 wins. See above. JUSTIFY THAT (King of Prussia). 13 wins to 1400m, A$522,245, to 2016-17, SAJC Christmas H., L, Penny Edition S., L, Star of Christmas Final H., Lexus H., Schweppes H., Dawn of the Planet of the Apes H., Melbourne Cup Live at Morphettville H., Medallion Homes H., Penna Michael Chartered Accountants H., Schweppes Tonic H., Holdfast Insurance H., 2d Balaklava Cup, L, 3d Oakbank S., L, SAJC Durbridge S., L.
Pride (Wilkes). 4 wins-1 at 2-at 1000m, 1200m, MVRC Manitoba H., Ailsa H., VATC Glen Eira H., 3d VRC Edward Manifold S., Gr.2, VATC Debutante S., L. Producer. MIGHTY SUPREMO (Mark Anthony). 10 wins-1 at 2-to 1400m, A$115,705, VRC Moomba P., Gr.3, MVRC Glenara H., The Tetrarch H., 2d SAJC Goodwood H., Gr.1, VATC Victoria H., Gr.3, Schweppes Cup, Gr.3. AVATAR (Showdown). 9 wins from 1100m to 1600m, A$207,700, VRC Tattersall's P.H., L, 2d VATC Toorak H., Gr.1, Futurity S., Gr.1, VRC Pure-Pak S., Gr.1. Sire. HOUR OF PERIL (Fusaichi Pegasus). 6 wins from 1200m to 1600m, A$265,010, Qld Tatt's RC Tattersall's Mile, L, BRC Mick Hall Rock Vegas 3YO H., Kate D Art & Colour H., 2d BRC Rough Habit P., Gr.3. CHONG TONG (Encosta de Lago). 6 wins-2 at 2-to 1400m, A$508,830, MRC Sandown S., Gr.3, VRC L'Oreal Paris P., Gr.3, Bobbie Lewis H., Gr.3, Sutcliffe S., L, BTC Merry Christmas 2YO H., 3d VRC Lightning S., Gr.1. Race Record: 12 Starts 5-1-0 A$62,750. 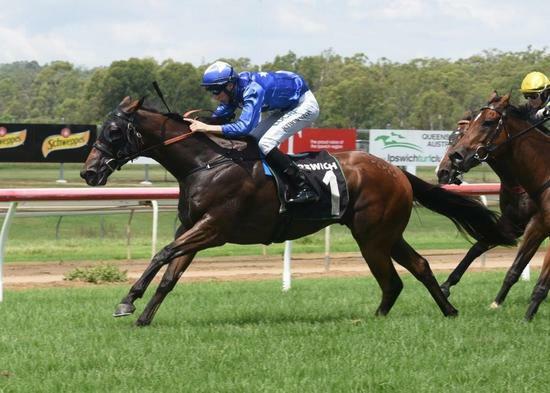 5 wins at 1200m, 1400m to 2017-18, GCTC Eqpay Horse Racing H., Ipswich TC Sky Racing H.